This April, English teachers, Anglophiles, all buddies of the Bard will commemorate the 400th anniversary of William Shakespeare’s death. Museums, libraries, schools, and theater companies are marking the occasion with special events like the homecoming of the Globe to Globe tour of Hamlet, which will have performed in around 200 countries by the time the company’s journey ends; Chicago Shakespeare’s Shakespeare 400 Chicago; and the Folger Shakespeare Library’s First Folio Tour, which will bring a First Folio from the library’s incredible collection to every state in the union and Puerto Rico (I’m counting the days until it reaches Wisconsin in November!). campus and around the country. In the spirit of celebrating Shakespeare and writing with mentors, I’d like to share my adaptation of the prompt book, a mentor text-based approach to teaching Shakespeare, close reading, and literary analysis that I learned while attending the Folger’s 2014 Teaching Shakespeare Institute. My seniors recently completed prompt books as a final assessment for our study of Hamlet, and the results were phenomenal. What is a prompt book? 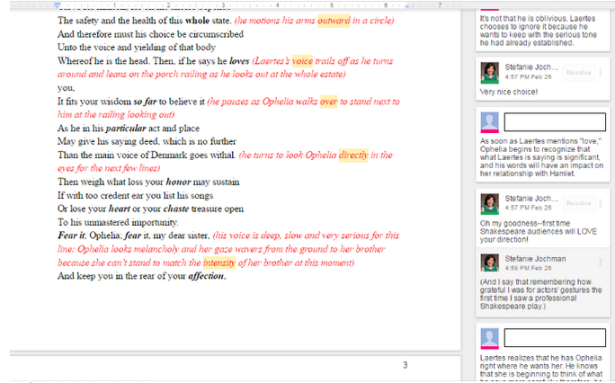 A prompt book is a copy of a play’s script that has been cut and/or annotated by the director. You and your students can explore historical prompt books in Luna, the Folger Library’s digital image collection. Here is a link to one of the Luna images I shared with my students, and here is a link to a prompt book with directions for Hamlet and Laertes’s swordfight. You’ll notice in these examples that directors have indicated where actors should move on stage, what gestures should be made, how a line should be delivered, or which lines will be cut. After sharing prompt book mentor texts with my seniors, I instructed them to choose a passage from Hamlet that we had not already performed in class and create a director’s prompt book for the passage. Then, I added another “layer” to the prompt book: after making their directorial decisions, students had to explain why they were making those choices (in other words, they had to articulate their analysis of the text). I asked students to craft the prompt book electronically using tools in Google Docs; students could italicize or recolor stage directions, and they could use the comments feature or a series of paragraphs following the prompt book to explain their directorial choices. However students chose to format their work, the prompt books had to demonstrate knowledge and understanding of the play, and Shakespeare’s language had to lead the students’ directorial choices. I allowed students to borrow ideas from films of Hamlet, but they had to credit the directors and explain why they thought those film directors’ choices were appropriate and worthy of mimicking. Here are the assignment directions I shared with my students. You’ll notice that my rubric is a lot like the one Rebekah O’Dell of Moving Writers created for her literature-based analysis–it just makes so much sense to me! Though I’ve had students make prompt books to supplement group performances of Shakespeare scenes before, the individual prompt books my seniors created were in a class of their own. The prompt books were creative and incredibly detailed, and, most importantly, they demonstrated a very strong command of the play and its language. I could see students’ scenes play out in the theater of my mind. If we have enough time after our IB exams have finished, I might challenge some of my budding directors to turn their visions into reality! Though my students also wrote in-class essays in the style of the IB exam they will eventually take, their prompt books were much better demonstrations of how deeply and critically they thought about the play and its characters. In a semester that is heavy on in-class analysis and exam preparation, this assignment was a fun, fruitful diversion for my students and me. Its success challenges me to re-think my approaches to the other plays in our genre study. Below are excerpts from two of my favorite prompt books. Because there are so few stage directions and so many figurative possibilities in the language, Shakespeare’s plays lend themselves well to a prompt book activity, but prompt books can be used in a variety of ways (Shakespeare-related or not!) in your classroom. I used this prompt book assignment as a final assessment, but you can use prompt books for “cold” close readings as well; pull an excerpt (no longer than a page) from a play and ask students to read the passage several times in several different ways. Once they’ve familiarized themselves with the language of the passage, students can start suggesting cuts, stage directions, or line readings using textual evidence to support their directorial decisions. For more on this option, check out this great blog post from another Teaching Shakespeare Institute graduate (and my teaching colleague at the 2016 institute that will be held this July) Greta Brasgalla. 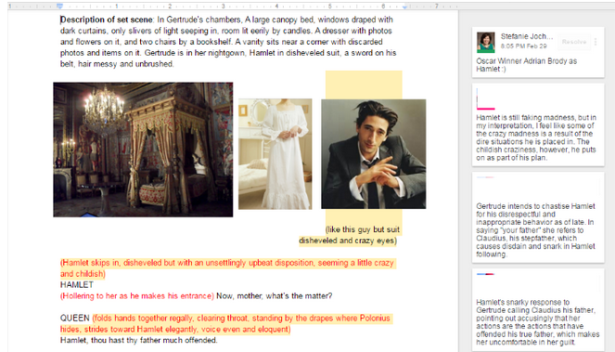 Ask students to adapt a scene from a novel into a screenplay with director’s notes. Students can look at screenplay examples in the Internet Movie Script Database that Allison mentioned in one of her posts last spring. Ask small groups to create prompt books for the same passage in a play; compare and contrast prompt books to recognize the possibilities in the play’s language. As a creative writing exercise, ask one team of students to write a dialogue and then pass the dialogue to another team; the second team must analyze the dialogue and write prompt book notes to accompany it, using evidence from the dialogue to justify the stage directions. Take your cue from one of my most creative seniors, who reframed Claudius’s soliloquy as a John Hughes movie bully’s bathroom confession (it worked–trust me! ), and ask students to make a prompt book that “remixes” or “re-imagines” a scene in an unexpected style or genre. Have any innovative approaches to Shakespeare or literary analysis? How might you use prompt books in your classes? I’d love to hear your ideas. Please tweet me @msjochman or reply in the Comments section below.